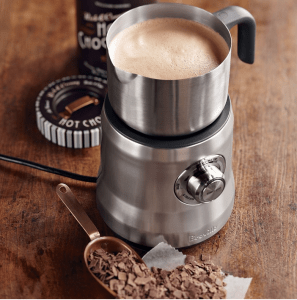 Breville BMF600XL is a hot new release steel cafe milk frother and hot chocolate whipper with an innovative magnetic whipper and a modern design overall. There is a latte frothing disc that helps make silky and smooth milk and a cappuccino frothing disc for thicker and creamier results. It comes with the usual details that you expect in a Breville machine. You can make hot chocolate with this one by just putting in some chocolate powder, or flakes to your milk. You can add syrup too but you will naturally get less foam with syrup. There is a little hole on the cord to be able to detach it easily from the power outlet. This is probably the only model that we know of with a temperature adjustment knob. And the optimal milk temperature range is shown just at the top. Stainless steel Breville BMF600XL weighs 4.61 pounds and measures 6 x 6 x 10.2 inches. You have the level indicators inside for cappuccino latte max and hot chocolate max, and 8 ounces, 16 ounces and max which is around 22 ounces. It is easy to clean as the frother uses induction heating, the jug can be placed in the dishwasher. 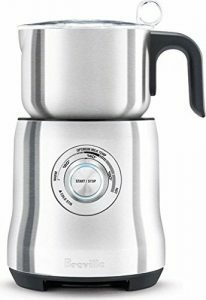 This brother is capable of frothing or steaming any type of milk for whatever you want to use it- coffee or other drinks. When you turn it on and it starts whipping the light on the temp knob will keep flashing till it is done. If you put a lot of milk in the jug and set the temp to the highest, it will take longer to complete the task. The milk temperature will get to around 180 degrees Fahrenheit. It does a very nice job, with milk and cream tasting really good. It is pure stainless steel inside and out and there is no teflon non-stick coating. It makes a bit of noise during the operation but for the results you’ll get it is well worth it. You can froth soy milk, almond milk and more but the froth will be much better with the normal whole milk. If you tilt the milk brother a little it will catch all the milk and you’ll get better results. A frothing and a stirring disc are included in the box, and you’ll find a magnetic storage spot at the rear. Even when you don’t have the temp turned all the way up it will give you warm to hot frothed milk. If you use the cappuccino disc you’ll make enough foam for a very large cup of cappuccino or two smaller cups. And you can get two medium sizes with the latte disc. The task will be completed within two to three minutes and you’ll only hear a very light beep sound when the milk is hot and ready to be served. Many customers claim this to be the best and the easiest to use frother they’ve ever had. Breville products are often very good quality and are backed by a decent warranty and great customer support.